I take (at least) one photo each day and designate it my Photo of the Day. 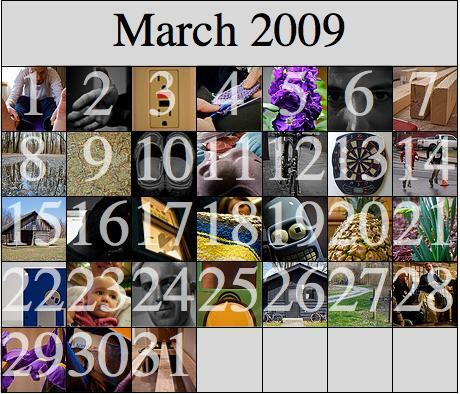 I have a set on Flickr with all of these photos and I thought it would be interesting to look at these in a calendar layout. I wrote a simple Mathematica package to do some basic photoset and photo management on Flickr. Using this package it is a simple matter to download all the Photos of the Day for a given month and arrange them in a calendar layout. Get a list of all my photosets. Get the ID of each photo in the "Photo of the Day" set. Import the 75x75 pixel "Square" sized thumbnail of each photo. Overlay the day of the month on top of each thumbnail. Get the URL of each image and make the tiles hyperlinks. Now write a reusable calendar function which takes a list of content and lays them out into a grid for the specified month. Now add the tile images to the calendar. We could export directly to JPEG, but since the image contains hyperlinks exporting to HTML will yield both a JPEG and the HTML code for an image map.